I had the most wonderful surprise this weekend! As I opened one of the blinds that faces out into my backyard I was surprised to see a small patch of sunflowers in full bloom! Why so surprised you might ask? Well, I didn't plant any sunflowers this year...or last year...or even the year before that! In fact I probably haven't planted sunflowers in 5 years or so and even then certainly didn't plant any amongst where they are currently growing - in thick brush at the back of our property. Nonetheless I'll take 'em! They are my favorite flower - my house is quite frankly littered with sunflower paraphernalia. There's just something about their happy bright petals that has always made me smile...so much so I just had to cut a few to enjoy inside - even if they only last for a few days. The most ironic part of finding these happy flowers? I had already made the card I'm going to share with you today when I found them...spooky...its almost like I planned it this way when in truth it was just a happy coincidence! 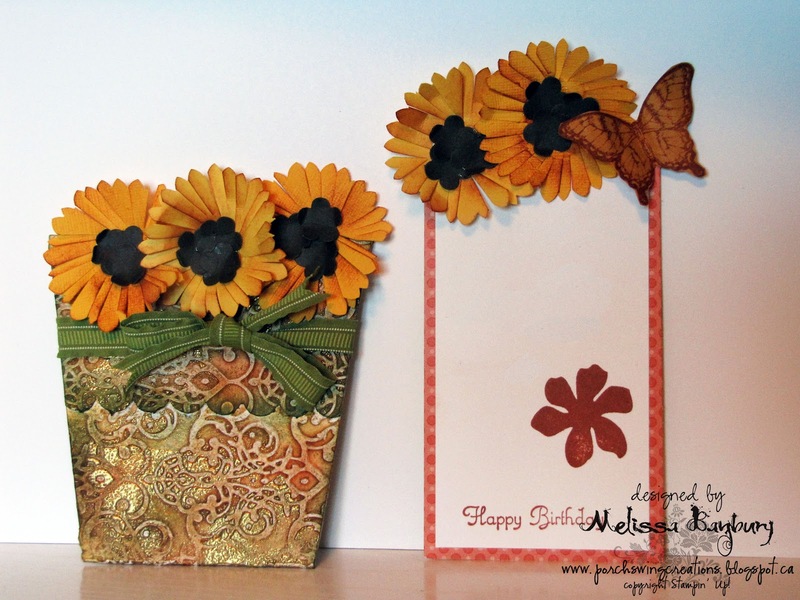 I found the template for this flower pot card on Splitcoast and envisioned it in fall colors with sunflowers. 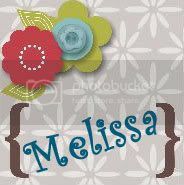 You pull on the top flowers and your greeting slides out! Wonderfully neat idea with a little surprise for the recipient!! The flower pot uses the Faux Patina technique; a technique I have done before; which can be found HERE. 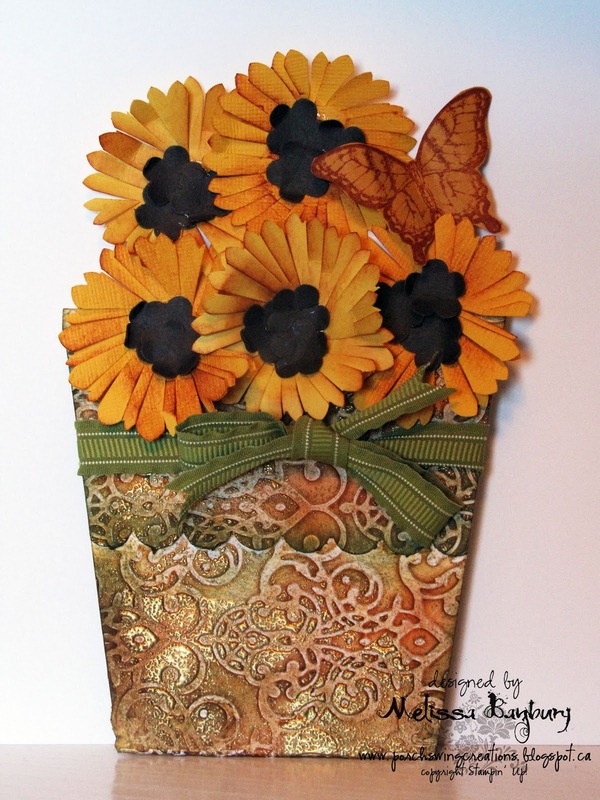 The sunflowers were made using the scallop circle punch. I punched the circle once then put the same circle back into the punch and gave it a quarter turn and re-punched to give the petals a more pointed appearance. Using scissors I then cut each petal from the tip to just about the center. Three flowers from the triple blossom punch were added to the center of each flower. Hope you enjoy your day! Thanks so much for looking!